With the fog a major cause of road traffic accidents, please have a read of these top tips for driving in fog and help you stay safe. Always use the dipped headlights in misty and foggy conditions. Some cars have an automatic setting for the dipped headlights, but don’t just rely on this when turning the engine on as it may not illuminate the rear lights, which are equally as important. Only use your fog lights if visibility is less than 100 metres, but don’t forget to turn them off when visibility improves. And refrain from using the full beam setting for your headlights as this will only obscure your visibility when it’s foggy. The conditions that cause fog also make your windows mist up, and the dirtier the windows are the more susceptible they are to clouding up quickly. So it’s important to keep your windscreen as clean as possible to prevent this from happening. You should also give your wing mirrors a clean before you set off to prevent them from misting up too – improving visibility all around you is paramount in foggy conditions. Fog can create sprays of rain on your windscreen, so make sure you use your wipers on the intermittent setting to retain a good level of visibility. Ensure your windscreen-washer fluid is topped up to rinse off any debris that flicks up off the road or other vehicles. If you’re driving in freezing fog, do not use your windscreen washer unless you have non-freezing washer fluid – the screen will be covered in ice if not. Maintaining a steady and consistent pace will ensure you can slow down or brake early enough to avoid hazards ahead of you as well as behind. If a vehicle behind you is following closer than you find comfortable, make sure you are going slowly enough that you are able to reduce your speed or stop without it being sudden. This will allow the car behind to not run into you. Fog can come in patches and with different levels of density, so only increase your speed when you’re confident the fog has cleared completely. Pedestrians and cyclists are extremely difficult to see in fog, so take extra caution to ensure you can cope with them. Keep your eyes peeled and make sure you drive at a reduced speed in built-up areas, giving yourself enough time to spot them. 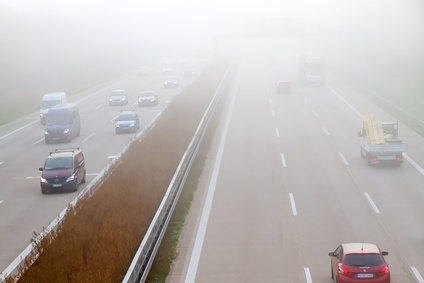 Fog can be dispersed by traffic, so when following a string of cars don’t be tempted to rush to the front – the car at the head of the queue may have a thicker wall of fog to contend with than the cars following further back. If you have to stop, whether you’re waiting for help while you’re on the hard-shoulder or on a side-road, make sure you and your car are visible to other road users at all times. Have the car’s lights on, use the hazard warning flashers, and wear a high visibility jacket to help other vehicles passing by identify you.